UC Berkeley issues the first-ever university transparency report. Others should follow. 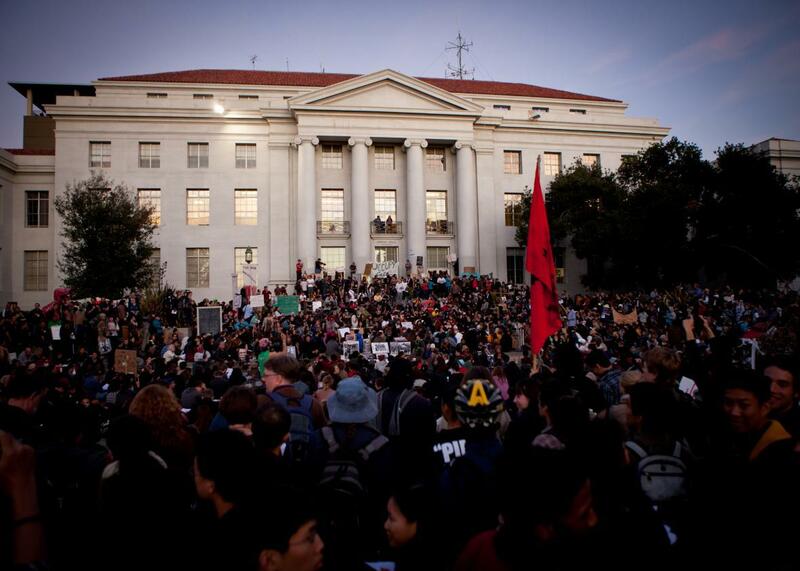 UC–Berkeley students protest on campus in solidarity with the Occupy Wall Street movement Nov. 15, 2011. The University of California, Berkeley, has become the first university in the United States to publish a set of transparency reports that detail government requests for student, faculty, and staff data. In the tech world, transparency reporting has become an industry standard. After Edward Snowden leaked the names of companies assisting with government surveillance in 2013, businesses eager to earn back public trust began a race to let users know as much as possible about how their personal information is handled. When companies release a transparency report, it’s always voluntary. In fact, the law actually limits what companies are allowed to disclose via a mix of gag orders and other burdensome restrictions. Colleges aren’t exactly tech companies—but they aren’t so different, either. Like many higher-ed institutions, UC Berkeley essentially functions like an Internet service provider unto itself. It has more than 37,000 students, 77,000 active university email accounts, and the potential for upward of 100,000 devices connected to the network at any one time. Unsurprisingly, the school occasionally fields requests from law enforcement for data. Academic and intellectual freedoms are values of the academy that help further the mission of the University. These freedoms are most vibrant where individuals have autonomy: where their inquiry is free because it is given adequate space for experimentation and their ability to speak and participate in discourse within the academy is possible without intimidation. Privacy is a condition that makes living out these values possible. The transparency report also offers a glimpse into how the university processes these requests. Before information is released, the requester must fill out a form for review by the campus privacy office. Depending on the nature of the request, it might be vetted by the Academic Senate and university counsel before being granted or denied. It’s particularly important because there’s a robust history of government surveillance of faculty and student activity. In the 1960s the CIA had an entire strategy dedicated to infiltrating the students’ rights movement in an effort to counter communism. The days of communist panic may be gone, but in 2012, it was revealed that the New York Police Department had bugged the meeting and prayer rooms of the Muslim Student Association at NYU and other East Coast universities. Federal surveillance programs clearly have an interest in contemporary university life, making transparency about steps a university takes to protect personal data on campus networks even more essential. Other higher-ed institutions should follow Berkeley’s lead—maybe even compete to have the most informative disclosures. For example, future transparency reports could also provide examples or specifics about certain cases they’ve encountered, similar to what Wikimedia did with its innovative reporting on copyright takedowns. Future campus reports might also consider disclosing how vendors like Google or library catalog systems collect data on faculty, students, and staff, a step that would also go beyond current federal education privacy law. It might be a lot of work for universities. But as educators know better than anyone, knowledge is power. Disclosure: The author previously worked at the Electronic Frontier Foundation, where she advocated on digital privacy issues in university communities. *Correction, Sept. 18, 2015: This post originally miscalculated the percentage of live accounts affected by nonconsensual searches at UC Berkeley. Thirty-nine divided by 77,000 equals 0.0506 percent, not 0.000506 percent. The count of Apple customers affected by government search was also misstated. Its transparency report notes 0.00571 accounts have been affected by government search, not 0.000571, as reported.